Launched a new monthly whisky tasting group in Mumbai – exclusively for ladies! 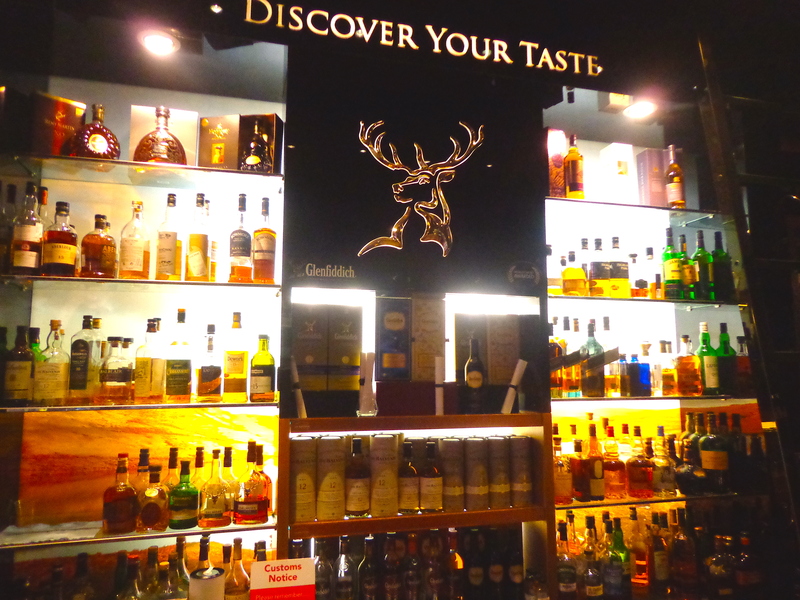 By September, celebrated 100 posts with a list of 100 whiskies sampled!! Glenmorangie dinner pairing with Master Distiller Bill Lumsden – how it SHOULD be done! 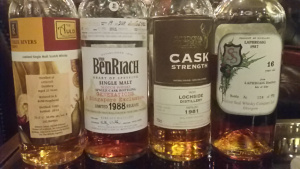 A Secret Supper of rare malts featuring Auchentoshan ‘Pure Malt 40% (Eadie Cairns), Port Ellen 26 year (1982) 50%, Lagavulin 16 year 43% (White Horse) in tribute to Malt Maniac‘s 20 years! Party Whisky – Amrut’s MaQintosh – I guess no one else has reviewed this?? The Quandary of the KininVie 17 year – A quandary no more thanks to a sample! 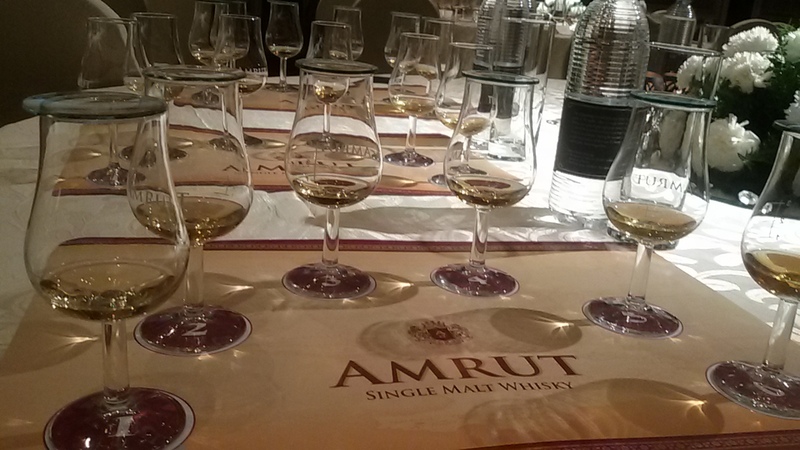 Mumbai Amrut and Jim Murray experience – Memorable but not for the reason they would want! No surprise that my adopted country India tops views by a wide margin! I wonder who my German friends are? For Australia, I suspect most views come from just two fabulous Tasmanian guys! 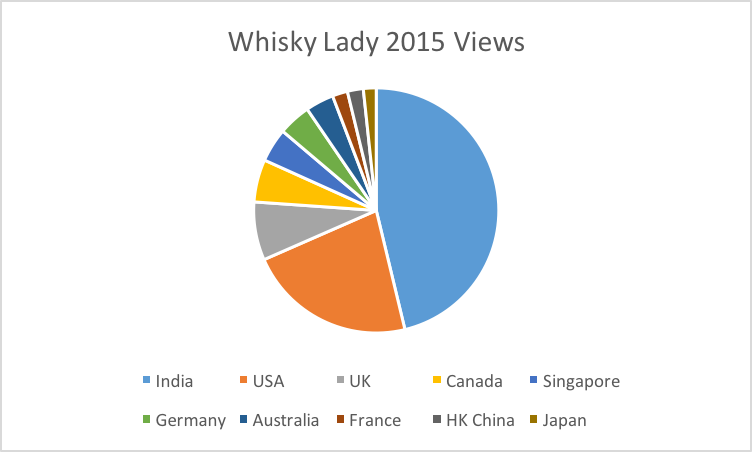 I would also like to share a special ‘nod’ of thanks to fellow whisky bloggers for their comments and encouragement – particularly Malt Activist, Whisky Den, Whisky Waffle, Whiskyriffic (with extra thanks for the KininVie sample! ), Whiskey and Whisky. Any whiskies stand out for you? Anything you would like to see more of here on Whisky Lady? Ideas? Recommendations? I still consider myself a novice in the world of whisky and welcome words of wisdom from fellow whisky explorers! Most important – wishing you a very Happy New Year – may you drink a quality dram over quantity! For more 2015 highlights, check out WordPress 2015 Annual Report or delve into the details shared in Everyday Asia’s monthly Whisky Lady summaries: December delights, November novelties, October offerings, Sulty September, Awesome August, July journeys, June joy, May merriment, April adventures, March madness, February fun, January journal. 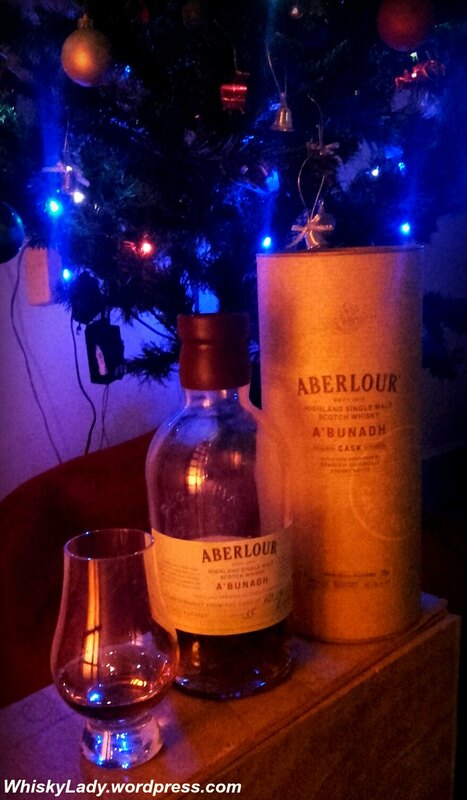 One of the first cask strength whiskies I remember picking up was Abelour A’bunadh. I was in Singapore airport, they had lots of different whiskies to sample however this one caught my eye. I will admit, I knew next to nothing about it at the time…but it was very affordable, I hadn’t tried it before so it joined my journey back to Bombay. It was opened with a mad group of friends and became a hit. For many, it was also their first introduction to an unabashed sherry bomb. And yes it packs a punch with alcohol ranging from high 50s to low 60s. Over the years, more than one A’bunadh has made its way in and out of my collection. While it is No Age Statement (NAS) blended from barrels between 5 to 25 years, you can tell immediately by the batch number what year the whisky was bottled. And there are slight variations between batches though the overall rich robust berry sherry element remains the core profile you can count on. Most A’bunadh’s I’ve had were from the 20s… however a few from the 30s too. 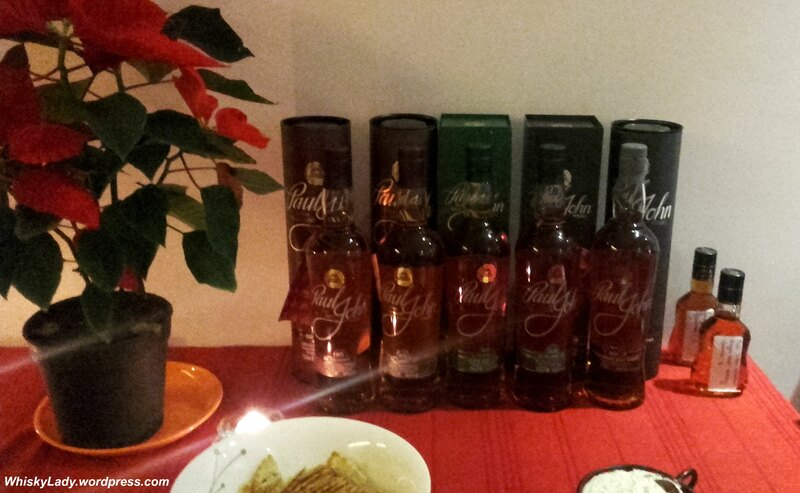 Then we started our whisky tasting group and a whole new world of whiskies opened up! And Abelour’s A’bunadh was no longer a priority when passing through Singapore. 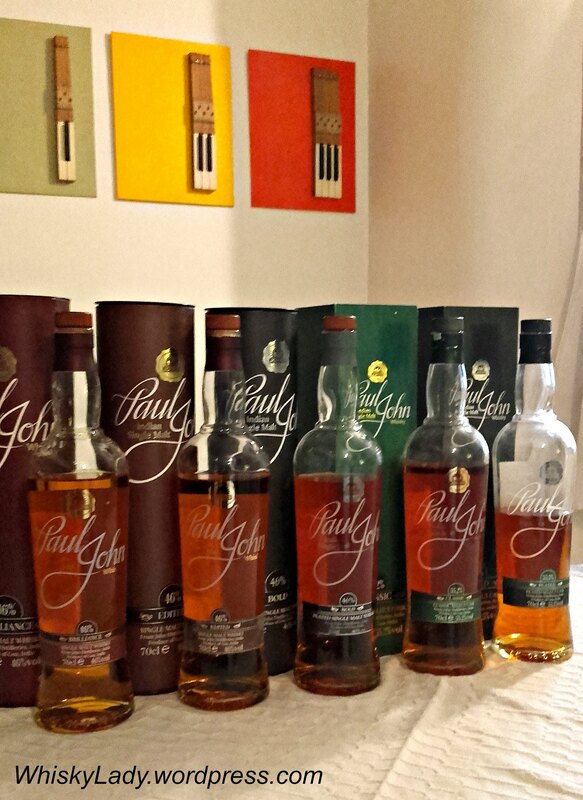 However as it remains an affordable dram, I did pick up a bottle or two a few years ago. Which meant that I had both a Batch No 35 (bottled 2011) and Batch 40 (bottled 2012) kicking around in my cupboard. For Diwali, Batch No 35 joined the Whisky Ladies Cask Strength evening – which was greeted by enthusiastic delight from one friend who remembered well our earlier A’bunadh evenings. Her infectious appreciation lead in no small part to the bottle being well dipped into that night! So when I was in the mood for something ‘Christmasy’ while we still had our tree up, revisiting the A’bunadh seemed about right. Overall, my findings were in complete agreement with our Whisky Ladies with only a few additional elements here and there. Water – This one works straight yet also does a happy dance with drops or a dollop! Absolutely perfect for a chilly evening (ok that means 22’c in these parts! ), with a kitten curled up purring beside me, watching the Christmas lights dance in our tree. In short absolutely hits the spot for a Christmas sherry bomb dram! We sampled the Speyburn 10 year together with Stuart Harvey, master distiller with Inver House responsible for Balblair, Old Pulteney, AnCnoc and Speyburn whiskies – both at a sociable ‘home appreciation’ evening and then the next night at a masterclass. Speaking about the Speyburn distillery, Stuart shared it is one of the 1st mechanical malting in the world, with an onion shaped still that produces heavy oils from its squat shape. The whisky is then matured in American oak bourbon casks, with some time in sherry butts for finishing. And what did we find with the 10 year? 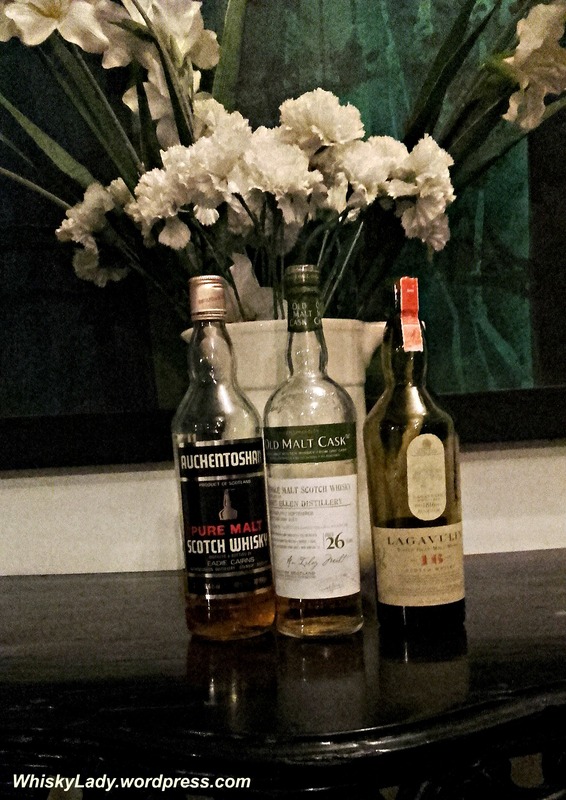 Interestingly, it was the least expensive of the whiskies sampled with the Inver House folks, however it was also one which appealed to many at the ‘home appreciation’ evening… Partly as it works well with the desi style to drinking whisky… chill with ice and drown with water! The next evening in the Masterclass it also held its own… It will be interesting to see whether Speyburn tickles the desi whisky palate and gains popularity. It certainly does well in the US, so why not India? Taste – Medium bodied with hints of toffee & butterscotch and a long, sweet finish. 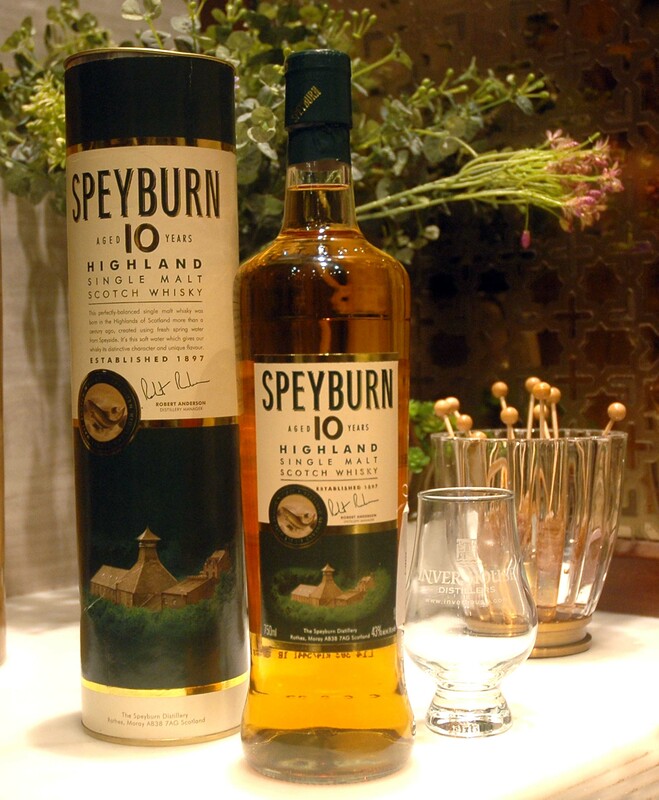 A global favourite, Speyburn 10 year old is ever the crowd-pleaser. Often when people of a peaty persuasion are looking for a reliable single malt to enjoy or gift, I will direct them to Lagavulin 16 year. This islay whisky is known for its ‘house style’ of well balanced peat, rich, dry and entirely dependable. Lagavulin will officially turn 200 next year… unofficially it actually is a wee bit illegally older harkening back to 1795. 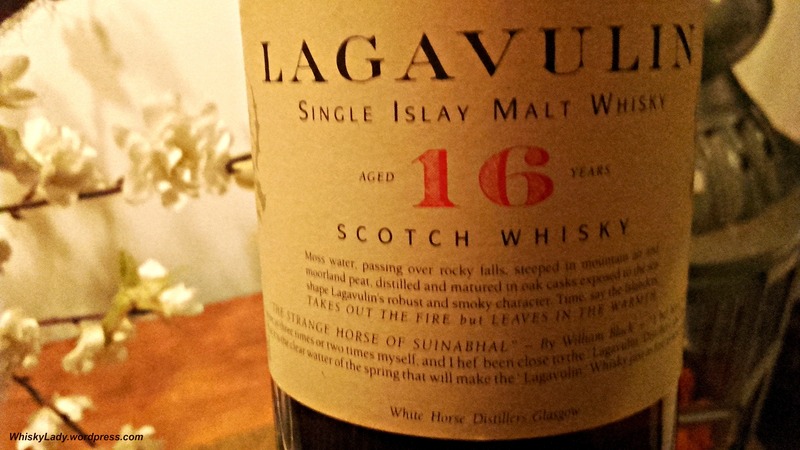 So what a treat to sample an earlier incarnation of the iconic Lagavulin 16 year! Comments included “has the smell of an old library” and the “taste of rust.” Which may not sound terribly pleasant however when you experience it, has a compelling quality. With the reveal, it was considered the “dark horse” of the evening as it displays the classic roots of our familiar friend – the modern avatar of Lagavulin 16 year – with some distinctly different notes. This particular bottle is a collectors item – part of the initial 16 year old releases in the 1980s under the ‘White Horse’ label. Interestingly, Lagavulin was indirectly responsible for our evening… it was the ‘amazing discovery’ of Lagavulin whisky that sparked the whisky explorations that became Malt Madness – read the story here. It also, in turn, transformed a regular working man on a trip postponing his flight back to India, getting a car and driving straight to the distillery to morph into India’s Malt Maniac. It even brought together members of our Mumbai private whisky tasting group who 1st met at the Lagavulin distillery… A fitting note indeed to close our rare malt transport back in time to the flavours and feel of whisky from the 1980s. This remarkable malt came courtesy of India’s Malt Maniac Krishna Nakula at an evening organised by The Secret Supper Project and The Vault Fine Spirits in celebration of 20 years of Malt Madness. Oh the elusive allure of sampling from a discontinued distillery! Once upon a time, Port Ellen was home to innovation, industry and experimentation. Established in 1825, a shrewd early owner Ramsay pushed Port Ellen to become the 1st distillery to secure the right to export large casks to North America, set up a bonded warehouse system that remains in use today, part of creating continuous stills, established an Islay steamboat, imported Sherry and Mediera to Glasgow and even tried his hand at politics! Though his family sold their interest in the 1920, Port Ellen continued to operate maltings and the bonded warehouses, re-opening with two more stills in 1966-67. However by 1983, a choice had to be made… to close Caol Ila or to close Port Ellen? Caol Ila fans remain ever so grateful their distillery was given new focus and life… whereas many industry pundits bemoan the absence of new Port Ellen offerings with its versatile style. Some sherry-casked Port Ellen can be beautifully rich, spicy, sweet and leathery; bourbon and refill casks often show a more austere, peppery medium-weighted style. Common characteristics, though, are a high level of peatiness and, in the best examples, a phenomenal complexity which Islay fans adore. For these reasons Port Ellen has become one of the most sought-after of the lost distilleries by collectors, investors and aficionados. This particular Port Ellen was aged 26 years… part of the last batches laid in September 1982 and bottled in July 2009. There are only 712 bottles in existence released by independent bottler Douglas Laing & Co as part of their Old Malt Cask series. The presence of peat is unmistakable yet it is restrained in the most enjoyable way. In short, an absolutely beautiful dram! Yet it is how our senses interpret that makes appreciating a complex, interesting whisky so special! This remarkable rare malt came courtesy of India’s Malt Maniac Krishna Nakula at an evening organised by The Secret Supper Project and The Vault Fine Spirits in celebration of 20 years of Malt Madness. Yes I get that as they are triple distilled, my palate should calibrate to something light, refreshing and more nuanced. Yes I also get that not all Auchentoshan’s are created equal. I remember being delighted with some special Auchentoshan’s sampled at the now defunct “Vault” in Singapore… followed by being universally uninspired ever since… until now! We sampled this beauty blind at an evening which featured a trio of rare whiskies from the 1980s… providing a unique ‘flashback’ to single malts before the current craze that has whiskies flying off shelves around the world with the award winning pronouncements of one man! Leading up to the unveiling there was talk of it being an ‘old style’ whisky… clearly before the 1990s. Sure enough – more than one sampler was surprised with it being an Auchentoshan. 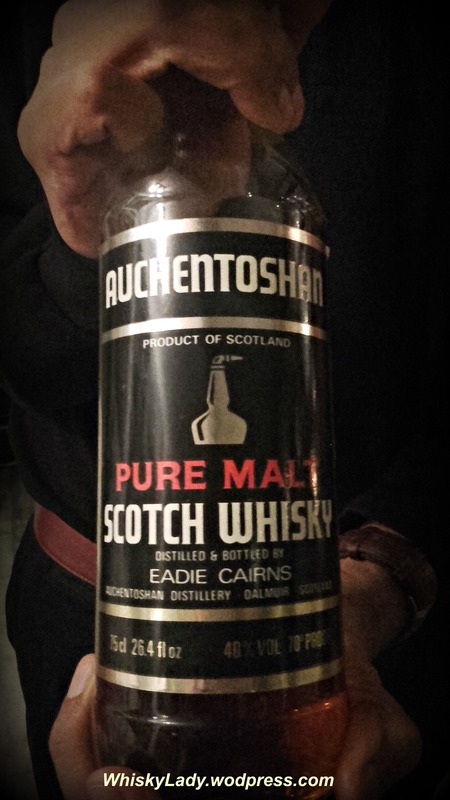 Krishna shared that the era of Eadie Cairns who rebuilt the Auchentoshan distillery completely after purchasing it in 1969. The night before, we were ‘wowed’ with a quartet of 1970s Glendronach grand dames from 39 – 42 years. The 1980s was a time of pac-man, tetris, Apple computers, big chunky jewellery, hair that defied gravity, caked on make-up, and some very bad pop hits. For some of us, the 1980s was also a time where we shouted “ban the bomb” and “anhilitate apartheid!”, where we stood firm with our brethren in Tiananmen Square, the Palestinian intifada, watched the wall come down and yes… had funky spiked hair, grunge clothes and hung out at punk rock gigs. However, the 1980s didn’t happen to be a time that I could afford whisky! I was far too deeply buried into heavy academic tomes to surface to sniff, swirl, swish and swallow a single malt. Rumour has it that the 1980s happened to produce many rather good drams. More than a few whisky experts around the globe speak of how whisky styles have changed between ‘then’ and ‘now’, noting that with the increased demand for single malt growing globally, production methods, quality controls and shifts in palates have created differences in whiskies produced 30+ years ago with those matured today. After sampling the remarkable Glendronach grand dames and then the rare Karuizawa 39 year from 1973 with whisky stock laid in the early 1970s, we had another exceptional evening that sampled whiskies from the 1980s… There is indeed something ‘different’ about these drams! Sometimes you feel like channeling your inner fisherman… a little swarthy, gruff but still seaworthy despite being a bit rough around the edges. 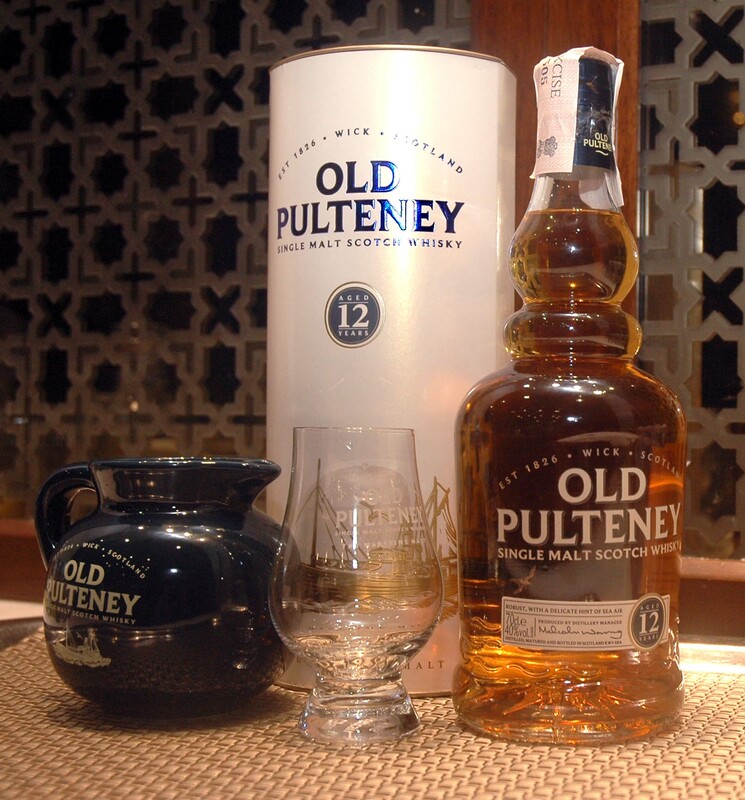 If you like your whisky a little like that, the Old Pulteney might just be one for you! Some months ago, we sampled the Old Pulteney at a master class held in Mumbai with Inver House master distiller Stuart Harvey. Stuart shared that the Old Pulteney new make spirit is quite ‘meaty’ with vegetal and noted that much of the sea salt comes from the casks absorbing the ambient air during the maturation process. It does indeed have a distinctly briney character very much in keeping with its maritime spirit! Taste – A bit more of that brine upfront then in bursts some citrus, chewy tobacco, leather, woody, salty, honey and again that curl of vanilla, perhaps a hint of cinnamon bark? Water – Really… if you must! For the Old Pulteney, Stuart encouraged a drop or two of water. However suggested to never have more than 50% whisky and 50% water as the Old Pulteney is already 40%. Before bringing out a special treat of an older Old Pulteney, Stuart shared that originally the distillery only produced the 12 year… it was one of the first projects he had as Master Distiller to go beyond the 12 year alone to introduce the 17 year and 21 year. I quite enjoyed the slightly rougher edge and maritime feel of the Old Pulteney 12 year – it has an unmistakable ‘stamp’ that distinguishes it as a distinctly ‘sea-worthy’ Highland whisky.